St. Peters Missionary Baptist Church received it's birth in 1892 by a group of men, Brothers William Futch, Ab Albert, Hill Patrick, A.J. Dixon, Doc Welch, and John Ruskin all members of St. John’s Missionary Baptist Church in Waycross, Georgia. They wanted to build a church in their own community lovingly called the Branch. After holding services in Reidsville School for a while, The first church was built at 128 Walters Street. Mr. Bud Horton was the contractor. Rev.R.B Bryant was the first pastor. Morning and evening services were held on the 1st and 3rd Sunday. Baptist Training Union was held on Sunday afternoon. Rev. Bailim Molett was our next Pastor. The church continued to grow and the building became to small for the membership and a larger building was constructed under the efficient leadership of Rev. Molette. The building was large, It was a beautiful white building with a large balcony. The Baptism Pool was large and located outside. Up in the balcony was a large bell. The church keeper would ring the bell on the hour of service, when a church member passed, and other occasions. The bell is now located out in front of this present building. The late Sister Rosetta P Griffin, affectionately known as "teacher" taught little boys and girls how to read and write. Other Pastors who have served are Rev. W.E McDavis, Rev. O.S Dixon, and Rev. C. Chapman.When Rev. Chapman answered the call it was during the time of the Depression. Times were hard and so were financial and living conditions. It was a hard struggle but with God's help the church made it through. Rev. S. M. Jackson was called and he kept the members focused on God. Rev. P. P. Reid was called and served 13 years and the church continued with its progress. Rev. J. J. Jenkins was called and served a short time. The next pastor called was Rev. E.O.S. Cleveland. He had a love for music. He would preach the word of God, move to the piano, play and sing. His gift of music added much to the service. Under his leadership he organized the first youth choir. Rev. L.W. White was the next pastor. He served for a period before Bishop N.A. Watson was called. The church advanced, He reorganized the youth department, enforced strong spiritual discipline for the youth of the church, 4th Sunday Service and 4th Sunday Choir and Trustee Day was organized and a water fountain was purchased he served six years. Rev. R.E. Avery was called. 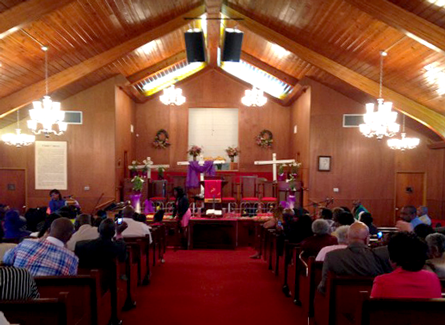 Under his leadership a building fund was established for the new St Peter's Missionary Baptist Church. Rev. W.H Byrd Sr, of this city succeeded Rev. Avery. Rev. Byrd was instrumental in carrying on the unfinished task using his knowledge he received by the wisdom of God. He was blessed to purchase this present site. After Rev. Byrd completed his time at St Peters the Rev. G.W. Warren was called. Rev. Warren was a man of God. He was blessed with the ability to stir up your soul with a gift of preaching and singing(your honeycombs). Rev. Warren moved on and Rev. J.W. Lowe was called. It was under his leadership that the dream of the new building was complete. On Sunday November 7,1965 the pastor and members of St Peters Missionary Baptist Church marched from the Walters Street sites to the present site at 300 Fireman Street. Joined hand in hand we marched to this present building. Our theme song was "We've Come This Far by Faith." This was truly a blessing. St Peters Missionary Baptist Church organized A.D. 1892, rebuilt A.D. 1910, and present site 1965. Dea. Falbert Davis (Chairman of Deacon Board). Rev. J.W. Lowe completed his work and the Rev. Adam James Shaw was called in 1968. Rev Shaw gave us, the church, 23 years of dedicated service. Rev, Shaw was a man of God. He was a pastor, leader, mentor, and a man of compassion. Under his leadership the A.J. Shaw Choir was organized, a new kitchen, ladies lounge, Pastor's Study, Discipleship class, the Church's 1st Homecoming was organized and was held on December 18, 1983, and the church was 91 years old. A centennial Celebration was held October 26 - November 1, 1992. The Y.W.A. unified the church and the Christian Education Workshop was started. The Fellowship Hall of the church was later named the A.J. Shaw Fellowship Hall in his honor. Rev Shaw served faithfully for 23 years until his health failed him. Even during his failing health he tried. Rev Shaw's health continued to fail and he retired leaving a history of love and dedicated service to the church. Then God called Rev. Dr. F.D. Mincey. Under his leadership some of our accomplishments are the Food Bank, Bus, Van, Family & Friends Day, Discipleship Class, tinted windows, Handicap Ramp, Computers, Copiers, Keyboards, and remodeling the kitchen. This is just to name a few. Rev Mincey gave us over 15 years of dedicated service before moving on. Rev. Bobby Hall was our next pastor and the church kept moving. Rev. Martae' Smith was the next Pastor he served for a short time and moved on. 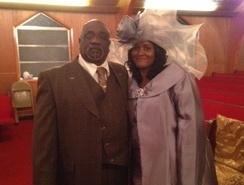 Then on September 16, 2012 God called Bishop Norris L Woods Sr, under his leadership we have purchased a new P.A. System, started a New youth program lovingly called voices of the youth(V.O.Y) the program is held every 2nd Sunday at 4 p.m. the program features a different church each month with the combined efforts of our youth department the program is designed to give our youth a voice. Their voice represents what ever talent God has blessed them with, it could be singing, playing an instrument, putting on a play, performing a praise dance, and the list goes on, and now we are launching this website. God has truly blessed St Peters Missionary Baptist Church. We have been through some hard times, through the storms, but it was God who brought us through. Many who started out on this journey are gone but the church is still here. The church will stand. Jesus told Peter in Matthew 16:18 And I say also unto thee, thou art Peter, and upon this rock I will build my church; and the gates of hell shall not prevail against it. We are approaching 122 years Oh what a blessing. As a husband of 28 years to a beautiful and supportive wife, a father of eight and a grandfather of 12, Woods wanted to ensure that the community’s children are in a strong, supportive environment. Together with his wife, Sis Michelle B Woods, Bishop Norris Woods Sr. were driven by the idea of giving young people a place where they can be heard, to showcase their talents and, most importantly, be a part of something positive. Women’s conferences focus on health, parenthood and marriage. The concept changes each year. Whereas the men's conference, Voices of a Godly Man(Man to Man), allows young men to see adult men in their natural habitat, teaches them about leadership, guiding families and responsibility. I come from a great background My mother and father were great motivators. My dad was a Navy man; my mother was a nurse. In our family, failure was not an option. But along the way my life took a turn to the point at which I didn’t care about much of anything I was alive but not living, One day I just got tired of living my life without a purpose and I decided to go back to my roots — church. The only thing I wanted to do was find peace and I knew I could find it in church. I never thought that I would become a pastor but I realized that all my past was for my present. Everything I went through was preparing me for the work I am doing now which is why I am so passionate about never giving up on anyone. My ministry is built on recovery. I believe God has designed all of us, to help everyone recover from whatever they are going through. I know someone helped me. A gentleman came and prayed with me in the middle of a lumber yard in Mill port, AL at a time when I was close to giving up completely and my whole concept of life changed. I wanted too not only be alive, but to live and to make a difference. Unbeknownst to me the man God sent to pray with me was Bishop: Leonard R Howell, of Aberdeen Ms, and Presiding General Bishop over ALL NATIONS MINISTRIES INTERNATIONAL. Wow; God came for me through this Bishop. From that moment on; Every thought, idea and action has been driven by God to make sure that the next person that's going through can see God in all my actions. BE THE MIRROR; let someone see the good in them, through you.